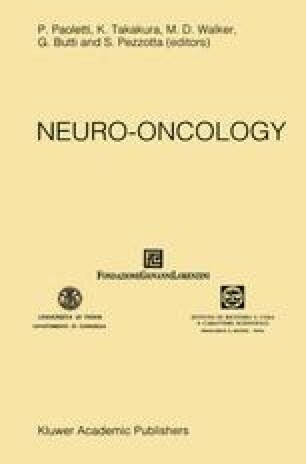 We evaluated the efficacy of methylprednisolone (MP) and dexamethasone (DM) in a randomized, prospective trial in 15 patients with primary and/or metastatic brain tumors. MP was given to 7 patients as an IV bolus of 1 gm, and tapered off in the following 7 days. DM was given to 8 patients at the daily dosage of 16 mgs for 7 days, and the day of surgery, and tapered off in the following 7 days. After 7 and 14 days, only the patients treated with MP showed a significant reduction in peritumoral brain edema volume measured by CT scan (P<0.01, P<0.0014, respectively). This study confirms the efficacy of MP in controlling peritumoral brain edema.